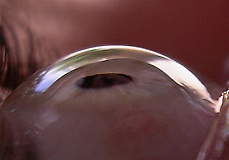 The cornea is the transparent front part of the eye that covers the iris, pupil, and anterior chamber. Together with the lens, the cornea refracts light, accounting for approximately two-thirds of the eye's total optical power. In humans, the refractive power of the cornea is approximately 43 dioptres. 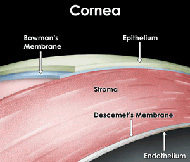 While the cornea contributes most of the eye's focusing power, its focus is fixed. The cornea has unmyelinated nerve endings sensitive to touch, temperature and chemicals; a touch of the cornea causes an involuntary reflex to close the eyelid. Because transparency is of prime importance the cornea does not have blood vessels; it receives nutrients via diffusion from the tear fluid at the outside and the aqueous humour at the inside and also from neurotrophins supplied by nerve fibres that innervate it. 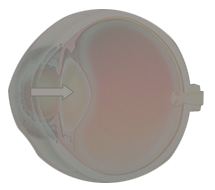 In humans, the cornea has a diameter of about 11.5 mm and a thickness of 0.5–0.6 mm in the center and 0.6–0.8 mm at the periphery. Transparency, avascularity, the presence of immature resident immune cells, and immunologic privilege makes the cornea a very special tissue. The cornea has no blood supply; it gets oxygen directly through the air. Oxygen first dissolves in the tears and then diffuses throughout the cornea to keep it healthy. 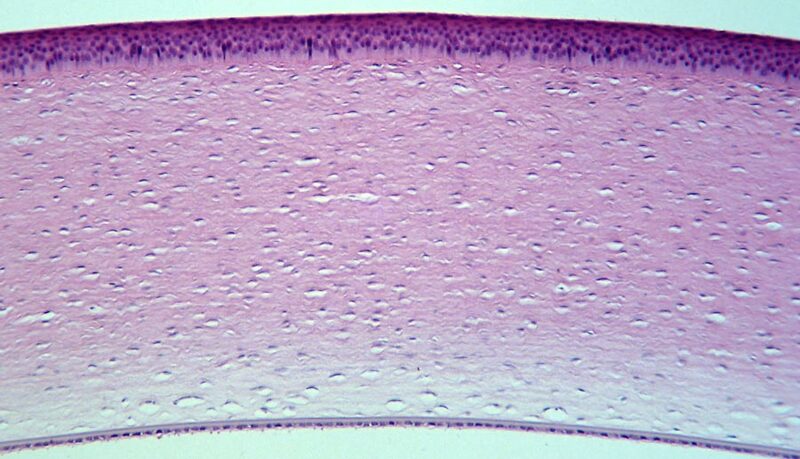 Corneal epithelium: a thin epithelial multicellular tissue layer (non-keratinized stratified squamous epithelium) of fast-growing and easily-regenerated cells, kept moist with tears. Irregularity or edema of the corneal epithelium disrupts the smoothness of the air-tear film interface, the most significant component of the total refractive power of the eye, thereby reducing visual acuity. It is continuous with the conjunctival epithelium is composed of about 6 layers of cells which are shed constantly on the exposed layer and are regenerated by multiplication in the basal layer. Bowman's layer (also erroneously known as the anterior limiting membrane, when in fact it is not a membrane but a condensed layer of collagen): a tough layer that protects the corneal stroma, consisting of similar irregularly-arranged collagen fibers, essentially a type of stroma. It is eight to 14 micrometres thick. This layer is absent in carnivores. Corneal stroma (also substantia propria): a thick, transparent middle layer, consisting of regularly-arranged collagen fibers along with sparsely distributed interconnected keratocytes, which are the cells for general repair and maintenance. They are parallel and are superimposed like book pages. The corneal stroma consists of approximately 200 layers of type I collagen fibrils. Each layer is 1.5 to 2.5 microns. Up to 90% of the corneal thickness is composed of stroma. 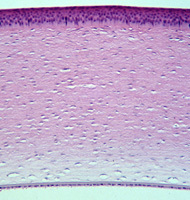 Descemet's membrane (also posterior limiting membrane): a thin acellular layer that serves as the modified basement membrane of the corneal endothelium, from which the cells are derived. This layer is composed mainly of collagen type IV fibrils, less rigid than collagen type I fibrils, and is around 5-10 microns thick, depending on the subject's age. Corneal endothelium: a simple squamous or low cuboidal monolayer of mitochondria-rich cells responsible for regulating fluid and solute transport between the aqueous and corneal stromal compartments. (The term endothelium is a misnomer here. The corneal endothelium is bathed by aqueous humour, not by blood or lymph, and has a very different origin, function, and appearance from vascular endothelia.) Unlike the corneal epithelium the cells of the endothelium do not regenerate. Instead, they stretch to compensate for dead cells which reduces the overall cell density of the endothelium and has an impact on fluid regulation. If the endothelium can no longer maintain a proper fluid balance, stromal swelling due to excess fluids and subsequent loss of transparency will occur.